The Cedar Rapids Public Library is thrilled to offer a new four-week program designed to introduce kids ages 5-7 years of age and their adults to early coding skills based on the book Hello Ruby. 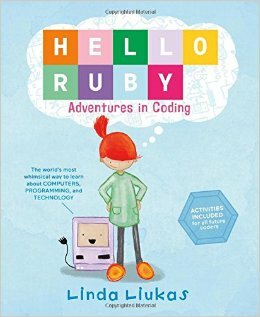 Hello Ruby is a book designed to be a whimsical way to learn about technology, computing and coding. The four-week program, called Children’s Adventures in Coding, will meet starting January 12 at 4 pm at the downtown library. Each week will build on the previous week’s skills, including reading from the book and participating in two to three early coding activities. No computers are used in this program, but basic skills necessary to learn coding are taught to begin laying the groundwork for this new kind of language. REGISTER: Registration is required and attendance at each session highly encouraged. Please click here to register, or call (319) 261-READ for assistance. Hello Ruby: Adventures in Coding Early Childhood Program is supported by the Giacoletto Foundation.